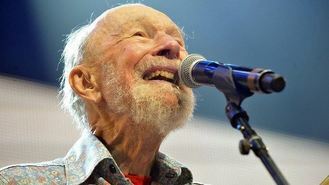 Music luminaries have honoured Pete Seeger on the shore of the Hudson River at the Clearwater Festival, the first of the annual music and environmental programme he started to be held after his death. Folk artists Tom Paxton, Tom Chapin, Holly Near, Dar Williams and others performed together to honour Seeger, who died in January aged 94. Sets were planned to focus on the music of the Weavers and Almanac Singers, both bands that featured Seeger, and highlighting the banjo, which Seeger frequently picked in concert. Lucinda Williams, Rufus Wainwright, Richard Thompson, the Mavericks, Norah Jones and Josh Ritter are among the headliners at the two-day festival expected to draw about 25,000 people. "It's up to us to pass the music on as he intended," Chapin sang in a verse written for the occasion in his song, "One Voice." Seeger began hosting "folk picnics" in the 1960s to pay for building a boat that would travel on the Hudson to highlight environmental issues. Seeger and his wife, Toshi, who died last July, lived in nearby Beacon, in a home with a spectacular view of a bend in the river. The informal fundraising concerts became the Clearwater Great Hudson River Revival in 1978. In recent years, it has settled in a park jutting into the river in this community 35 miles (56km) north of New York City and has modernised beyond its folkie roots. With the strong line-up, Seeger remembrances and sunny skies, organisers were expecting their biggest crowd ever. Chapin opened the tribute by singing Midnight Special, a folk song recorded by Seeger and others. Before singing Rainbow Race, Near urged the audience to remember how Seeger "walked into controversy and made us understand how to do that". Paxton recalled summoning the nerve to sing his song Ramblin' Boy to Seeger in 1963. Two weeks later Seeger performed it with the Weavers at Carnegie Hall, and the song later became the title song to Paxton's first album. Chapin led the audience in a sing-a-long to Seeger's popular anti-war song Where Have All the Flowers Gone? Beyond the collection of folkies, organiser Steve Lurie said several festival events were designed with Seeger in mind. They include an old-fashioned square dance like the one where Pete and Toshi Seeger met. One music set was to feature songs Seeger wrote in honour of Americans who fought in the Spanish Civil War. "My hope is that people who have already been part of the Clearwater community feel a sense of renewal," Mr Lurie said. "I hope people attending for the first time realise we're not just a music festival, we're a music and environmental festival and ... they learn a little bit about the mission."